A daring, kaleidoscopic novel about the clash of empires and ideas, told through a tennis match in the sixteenth century between the radical Italian artist Caravaggio and the Spanish poet Francisco de Quevedo, played with a ball made from the hair of the beheaded Anne Boleyn. The poet and the artist battle it out in Rome before a crowd that includes Galileo, a Mary Magdalene, and a generation of popes who would throw the world into flames. In England, Thomas Cromwell and Henry VIII execute Anne Boleyn, and her crafty executioner transforms her legendary locks into those most-sought-after tennis balls. Across the ocean in Mexico, the last Aztec emperors play their own games, as the conquistador Hernán Cortés and his Mayan translator and lover, La Malinche, scheme and conquer, fight and f**k, not knowing that their domestic comedy will change the course of history. In a remote Mexican colony a bishop reads Thomas More’s Utopia and thinks that it’s a manual instead of a parody. And in today’s New York City, a man searches for answers to impossible questions, for a book that is both an archive and an oracle. 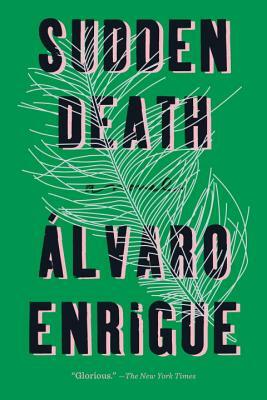 Álvaro Enrigue’s mind-bending story features assassinations and executions, hallucinogenic mushrooms, bawdy criminals, carnal liaisons and papal schemes, artistic and religious revolutions, love and war. A blazingly original voice and a postmodern visionary, Enrigue tells the grand adventure of the dawn of the modern era, breaking down traditions and upending expectations, in this bold, powerful gut-punch of a novel. Álvaro Enrigue was a Cullman Center Fellow and a Fellow at the Princeton University Program in Latin American Studies. He has taught at New York University, Princeton University, the University of Maryland, and Columbia University. His work has appeared in The New York Times, The Believer, The White Review, n+1, London Review of Books, El País, among others. This novel—his first translated into English—was awarded the prestigious Herralde Prize in Spain, the Elena Poniatowska International Novel Award in Mexico, and the Barcelona Prize for Fiction, and has been translated into many languages. Enrigue was born in Mexico and lives in New York City. Natasha Wimmer's translations include The Savage Detectives and 2666 by Roberto Bolaño. She lives in New York City. "A story of history plunging forward and the world at a defining moment. Rackets are raised; the court looms large. Finally a tale that truly defies the bounds of the novel."